Presenting our ABS-Lock X-SR-B anchorage point in moving images: Watch our short product video to find out more about its most important features! Thanks to its base plate (150 x 150 mm) and welded-on supporting tube (Ø 42 mm), this anchorage point offers a high level of stability when installed on a concrete structure - even with an installation depth of a mere 65 mm. This anchor - which has been awarded national technical approval - is easily installed using the 4 drive-in dowels supplied. 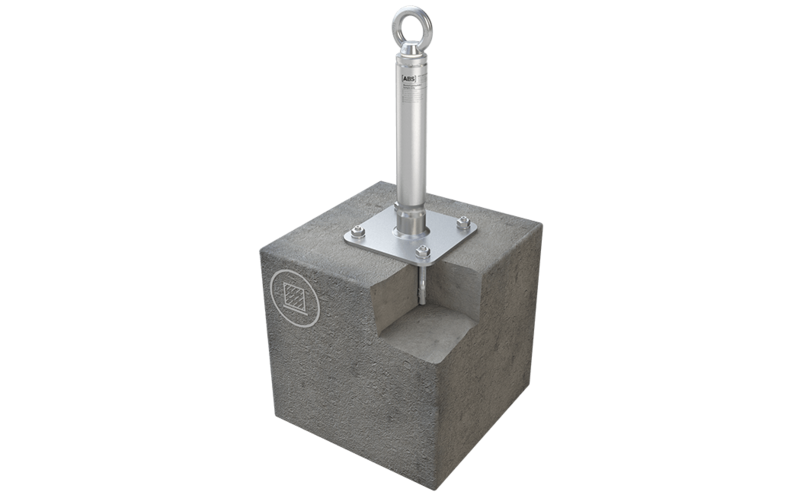 If you are looking for a strong support for a concrete surface: Meet our ABS-Lock X-SR-B single anchorage point - equipped with a base plate (150 x 150 mm) and welded-on supporting tube (Ø 42 mm). Simply attach this anchor to your roof membrane or facade using the 4 drive-in dowels supplied. You only need an installation depth of a mere 65 mm to install it. 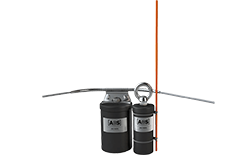 Our ABS-Lock X-SR-B anchor has been specially reinforced to make it ideal for use in a lifeline system. Use this anchorage device as a corner element or end bracket for a system that fits in just perfectly with your architectural design. There is a range of different rod lengths to choose from - from 300 to 800 mm. We also supply optional 100 mm and 200 mm extensions. Our ABS-Lock X-SR-B has been awarded national technical approval ("abZ") by the German Institute for Construction Technology (DIBt) and bears the obligatory Ü symbol. It can be subjected to loads in all directions and has been tested as a single anchorage point for simultaneous usage by 3 individuals.